When Walmart Canada Bethesda announced a sequel to 2010’s RAGE, I was as baffled as the next guy. RAGE was a decent game, don’t get me wrong, but it kinda came and went and nobody really expected a sequel. A sequel is exactly what we’re getting tho. id Software, makers of DOOM and Quake, are teaming up with developer Avalanche Studios (Just Cause, Mad Max) to bring back the open world shooter in the spring of 2019. I already got to play a small chunk here at Gamescom, and — pardon the cliché — it definitely left us wanting more. So what’s the deal with RAGE 2? 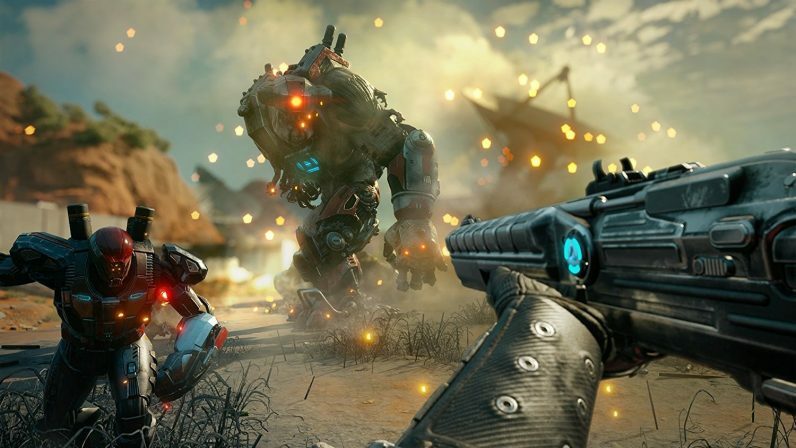 Like its predecessor, RAGE 2 is an open world shooter set in a post-apocalyptic wasteland, filled with weird characters, outlandish vehicles, and exotic weapons. The triple-pronged boomerang from the first game is back as well, and you’ll get toy around with a set of new super powers that make combat encounters a bit more interesting than those in your average shooter. Overdrive: a short burst of exceptional speed and strength that goes on longer the more enemies you kill. Very enjoyable to deploy in a big enemy-filled environment. Yea ok but was it good? The developers behind RAGE 2 have promised us big open environments with a ton of crazy vehicles to mess around with, but none of that was available during the very short demo I played. What I did get to play was good, the shooting felt good and the powers make standard combat scenarios way more interesting, but it’s hard to say anything about the total package from this tiny slice. RAGE 2 is due for release sometime in the spring of 2019 and I’m eager to see if the rest of the open world is as entertaining as the minuscule chunk I got to run around in today.